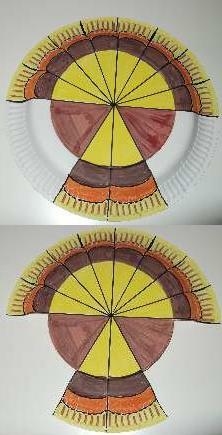 What a gorgeous looking paper plate turkey! There`s two to inspire you. Make as many color variations as you like with some felt tipped pens to color the tail feathers, and access the downloadable body parts by signing up to our CraftsWork Newsletter and Downloads. 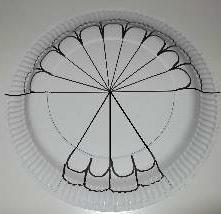 Draw a tail feather pattern like the one in the picture on the underneath side of a 9 inch wide white paper plate. Use a black marker to draw the outline. This will make the coloring in easy and give a nice bold effect. On each side of the line centering the bottom half of the plate draw a line to form the tail. It should have 2 sections a little wider than the top sections. Now it`s up to you to color in your project as you like. When you have finished cut away the white areas of the plate at each side. It`s all ready to have the body parts cut out and glued in place. 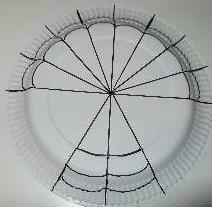 Now is the time to print out the paper plate turkey parts. 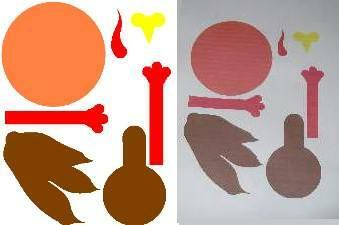 Either cut them out and use them as templates for different colored paper or stick them directly onto the tail feathers. The pic on the right is my printed off parts. Take note: There is only 1 wing on the PDF so it can only serve as a template. Use it to make another 2 wings. Let`s get this gobbler together! Stick down the tops of the legs and wings on the tail feathers first. Now on go the body and head. Stick all of the neck but only half of the head down. Last of all glue on the beak, the Wattle, that`s the red bit that dangles to the side of the beak, and last the googly eyes. 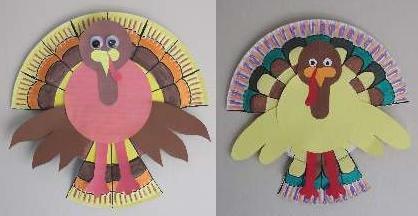 Doesn`t your paper plate turkey look stunning! Gobble, gobble! Make other versions by using different patterns for the tail feathers. Fill the sections in with alternative colors and also use alternative shades of red, yellow brown, and even purple and green. There is endless fun making paper plate animals. Just watch my collection grow. In the meantime here are some other paper plate craft. You find a the main categories for our crafts on the home index page.